Have You Been Told "Nothing More Can Be Done?" Have you or a loved one been told, "There is nothing more that can be done for your macular degeneration"? It is a very common statement made by ophthalmologists, optometrists and retina specialists to patients with AMD. Dr. Randolph Kinkade tends to disagree. 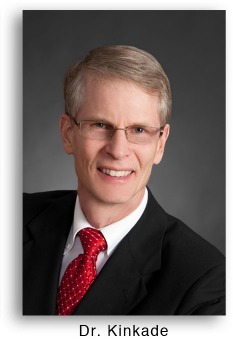 He is a low vision specialist that has been working in the field of low vision glasses for over 30 years. He states, "I find it hard to understand when doctors tell their patients nothing more can be done for their vision. This is usually true from a surgical, medical and regular eyeglasses point of view, but it is not true when talking about telescopic glasses!" What he is saying, is that perhaps there is no more treatment available that will improve one's macular degeneration condition, but there are special low vision eyeglasses. These glasses are designed to meet the needs of each individual since every eye condition is different. 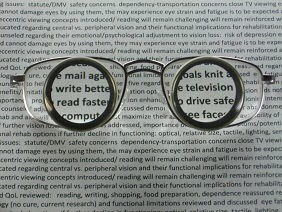 Glasses like spectacle miniature telescopes can greatly improve one's quality of life and enhance one's vision so that a person can return to reading the newspaper, using their computer or watching the television.